It’s way too expensive, as $500 would be better value, says students. Recently, news broke that fake degree certificates from Management Development Institute of Singapore (MDIS) and its university partners are being sold online through Chinese Internet forums. The going rate is about $10,000 a pop and the sellers claim to be able to provide supporting documents such as transcripts with good grades. However, several students interviewed said they are not biting the bait as the price is too steep. “Take that $10,000 and buy yourself some nice shirts and attend networking events, better still,” said Moses T., a hotshot self-proclaimed marketing executive. He claims to have turned down all forms of higher education because he didn’t believe in it but is now working in a hot shot marketing agency that he declined to name. 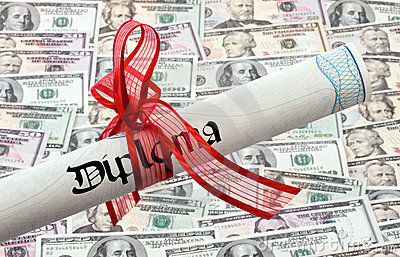 Others felt that degrees are not justifiable if the aim is to make money. “I know of a lot of friends who have degrees from NUS and NTU and they make peanuts,” said Wendy, a 19-year-old polytechnic student. “I know of others who don’t even have a diploma who run their own businesses and are raking in big bucks,” she added. But exactly how much would students pay if they could purchase a private university degree online? According to an informal street poll of 20 random students, the figure is between $5 and $500. “I could use $10,000 to start a blogshop business and keep rolling the earnings back into it. I’ll have a life, work for myself and get to wear pretty clothes. If I worked nine-to-five having applied for a job using a fake degree, it’ll probably still take me 6 months just to make that money back doing something I probably don’t like,” said Lin Na Beh, a 17-year-old unpretentious fashionista. Others are more sceptical of the education system in general.